Definitely replace it, my wife's phone does not do any of that. I got my g2 about a month ago and noticed this problem, along with a couple others, within a few days of having it. I googled the issues and found out a bunch of other people were having the same problems. They weren't deal breakers, because otherwise the phone is great, so I dealt with it. I went into T-Mobile a couple days ago with something unrelated, and brought up the problems in random conversation. They told me it shouldn't be doing that so they gave me a brand new phone. I got it yesterday and noticed by the end of the night, that it didn't help. One of the issues (screen jumping while playing Netflix) seems to be gone, for now anyway, but the knock on feature is still wonky (always works when turning off the screen but waking it up is a crap shoot), and the screen still flickers when it's dimmed. I noticed it seems to be more prevalent when scrolling. It's a small downside but an irritating one nonetheless. I'm hoping that it's a software issue and will be corrected with some kind of patch in a new update. I feel like turning this phone in, will only result in the irritation of having to set up a third phone, to find that it does the same thing.. I am having worse problem with my screen. It only few days old and it going crazy. Please advice. check out video..
Im on my 3rd phone also (LG G2) and my phone is having some of the same problems yours is having. I just got off the phone with AT&T tech support and told the guy my frustration with these phones i.e. screen flickering, not responding to touch when pushing icon, screen getting hot, etc, etc. He once again told me (like the others) that he never heard of these issues before with the LG G2. He then put me on hold for about 10 minutes and called LG Tech Support himself. He finally got back on the phone and said LG is aware of the screen issues and are gonna do a joint effort with AT&T to release a software update in the near future to address these issues but didn't give specific dates. He did on the other hand give me LG tech support number (which you could probably get from LG's site) which is 1-800-793-8896. He also informed me that this update is for the G2 and don't know anything about the nexus. Hi I too have the same problem as Sabrber and my screen goes grey after a while. ive had my phone for about 8 days now with no issues, YET and now after researching and finding out about how many people have this issue, im seriously considering exchanging this phone in since im still in the 14 days period for exchanges, for htc or something because I dont wanna be stuck with a messed up device for good after my 14 day grace period is over since so many people get this issue a month or so later. i have the same problem with my lg g2. how did you fix it? my wife's phone just started exhibiting this issue... has anyone come up with a fix? hardware or software issue? I know this is an old post but I figured I'd give a reply in case people like myself are looking for solutions to phone problems. 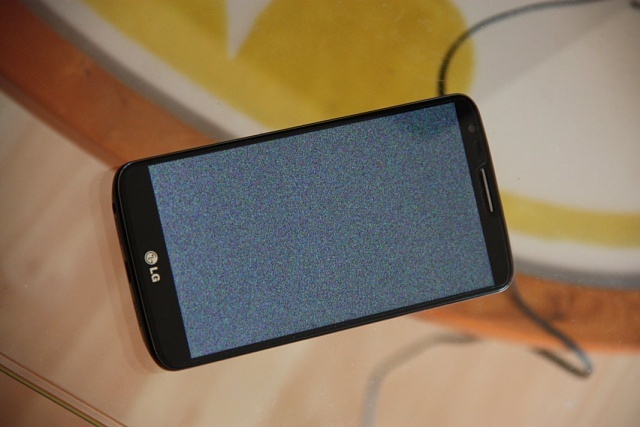 The fuzzy screen that you see on your phone is due to grounding issues on your screen connector. It can be easily fixed/replaced if its out of warranty. The picture I'm uploading is the screen removed from the core device. The little square section is the culprit. It has to touch/contact the side-bridge of the battery. Basically the only place it can touch lol. To fix the problem just grab some non conductive tape (scotch tape will do lol.) and just tape it up there to the battery if you have to. can you make a tutorial for this please? I have an lg g stylo. It started flickering after about a month. I did a factory data reset and the flickering stopped. For now. Dont forget to back up everything and pull sd card if you try. This seems like a dead thread. But i will take my chances. I have N5, 2 years old. 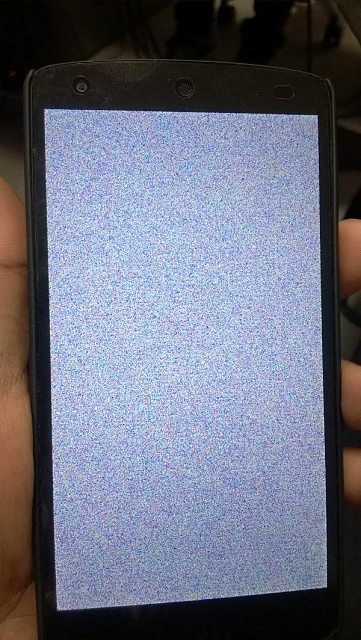 I have this dead phone with the color noise screen. 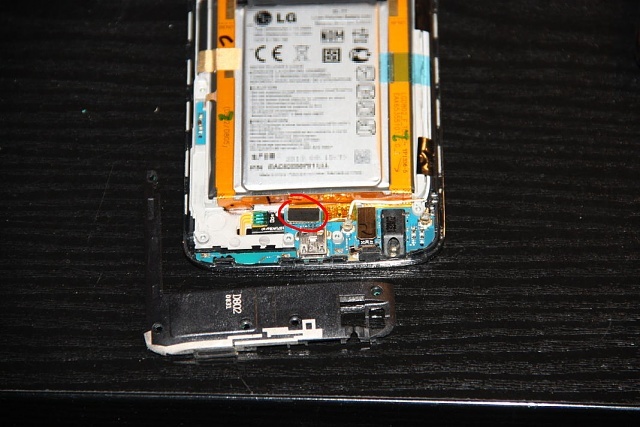 I googled and found out that this might be because of the flex cable. Was your phone back to normal once the flex cable was replaced? I was have the same problem. Thx for solution! I attach some photo. I don't understand.. Where is the square section? Where I have to tape? 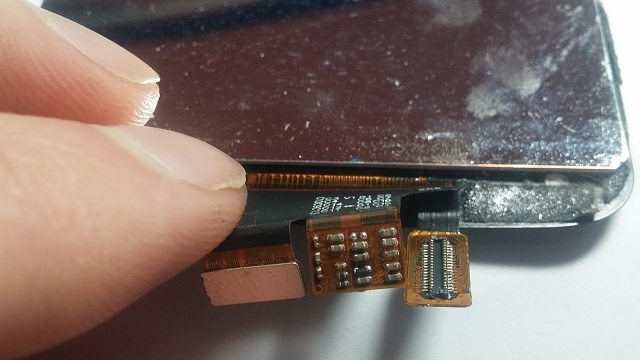 The flex cable is the two large copper-colored strips that run alongside the battery up to the main board? Sorry, doesn't make any sense to me... the part you circled is a connector that just clicks into its socket. What has it got do with grounding, or taping it to the battery ? Text Message Pop up on Lock Screen? HTC One ARHD update problem?